Want to make your words look fluorescent? Learn with me now! 1. First, create a file in ps. 2. Create a new layer as the background; set the layer style; select a dither. 3. Type into your words and make sure the font is junegull-rg.ttf. 4. Adjust the font size and space; add a new layer style for the words. 5. Copy the current layer style and paste it into other layers; adjust scale effect of the layer. 6. Create a “light spot” layer with its foreground color as #e5dfc9; use the brush tool to draw light spots in corresponding positions (size of the brush should be set according to size of the words). 7. After drawing spot lights on the words, use the smudge tool (size of the smudge tool is the size of the brush). 8. Add a layer style for the light spot layer. 9. Create a “coloring” layer to color the words; select a 60px brush tool and several colors to color the image. 10. Change the mode of the “coloring” layer as overlaying. 11. Now add some textures on the font: create a pattern at first; create a 5*5; use the pencil tool (1px) and define it as a pattern. 12. Create a “texture” layer under the “light spot” and “coloring” layers. 13. Now, let’s use the brush and the texture pattern to create a mottled layer. 14. After the brush is set, use it as the background; create a work path for the words. 15. Set the foreground color and the background color as #e8641b and #ffd200 respectively. 16. Use the direct selection tool; click the right button to select a stroke path. 17. After stroking all of the words, set the opacity of the texture layer as 50%. 18. Copy the word layer and remove its layer style; set the filling value as 0% and add a layer style. 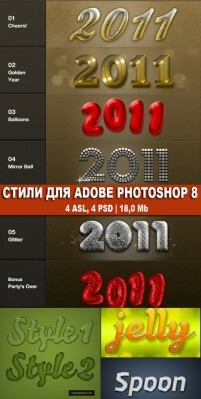 This entry was posted in Tutorials, PhotoShop Tutorials and tagged Colorful, Crystal, effects, Font effects, textures. Bookmark the permalink.